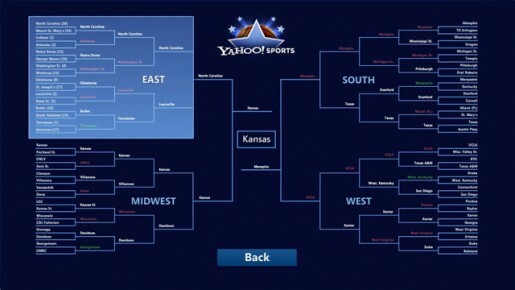 As a senior product manager at Yahoo, I led a team in the design and development of interactive TV applications for AT&T’s U-Verse TV, including sports, traffic, weather, finance information as well as Yahoo Fantasy Sports football and basketball games. AT&T U-Verse TV (a 100 percent IP-based television service) brings some of the most dynamic and feature-rich services to its users with its IP technology. Through AT&T U-verse, consumers can now benefit from integrated services that converge across the three screens they value the most: the TV, the PC and the wireless phone. U-Bar is one of those U-Verse services that offers a great convergence experience. AT&T U-bar is the Interactive TV application that shows customized weather, sports, stocks, and traffic information all at the touch of one button, without interrupting the current program. Users can launch the application from their remote control by just pressing the “Go Interactive” button. AT&T High Speed Internet subscribers can personalize the U-bar from the AT&T portal to display weather at multiple locations, your personal stock portfolio, scores for your favorite sports teams and local traffic information. My role on the U-bar project included writing up the requirements, managing the team, providing creative direction and coordinating with both AT&T and Yahoo! teams to release the product. 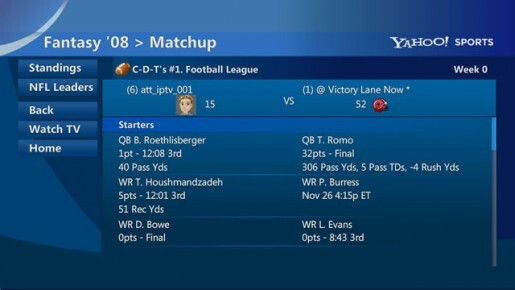 During the NFL season users can track their Yahoo! Sports Fantasy Football team from within the U-bar. They can create their own league or join an established league and view their team’s results updated as the games are played. Users can view tournament brackets, their personalized completed bracket, game summaries and box scores, and video clips of game analysis and commentary.